7 Easy Keto Desserts You Have to Try! But, for easy keto desserts, you have to do a little digging around. No worries, I’ve already done it for you and have compiled all of my favorites for you. Well, what is an easy keto dessert anyway? I mean, some people might tell you baking a cake is easy. I’m not one of those people, don’t you worry. To me, “easy” means minimal prep, minimal cooking and maximal taste. Is maximal a word? It ought to be. An easy keto dessert is first, purchased. Like, I just have to open it and eat. What’s easier than that? Second, if it’s not a store bought keto dessert, then it’s at least not something I have to prepare or cook or bake in any way. Barring a store bought option and a no cook option, the third best kind of easy keto dessert is one that is quick to put together. So that I can eat it. Fast. Now that you know the rules, let’s get started. Keto Desserts Store Bought? What Could be Easier?? Keto desserts, store bought. I know what you are thinking. Gross. I get it. But there are some really good options, I promise! Cookies are my favorite, I don’t know if we’ve had this talk already (we have). 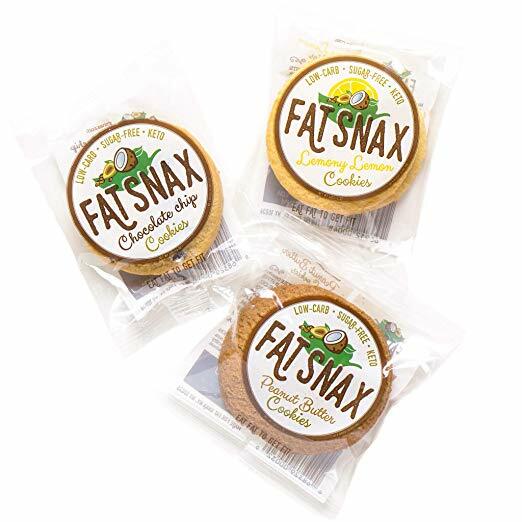 I need to have cookies around like Fat Snax because if there are non-Keto cookies around, I do not have a stitch of self control and I will eat the bad bad cookies. If I have Fat Snax around, I can whip one of those right out of my purse wherever I happen to be when regular cookies cross my path and I can still stay in my happy Keto bubble. Where the bad things can’t get me. I buy these from Amazon, btw, which counts as a store to me since it only takes two days to get to me and two days is also how long it takes to motivate myself to go to an actual store. Atkins was what I tried the first time I tried a low carb diet. It didn’t stick. Not like Keto has stuck. For nearly, a YEAR by the way! 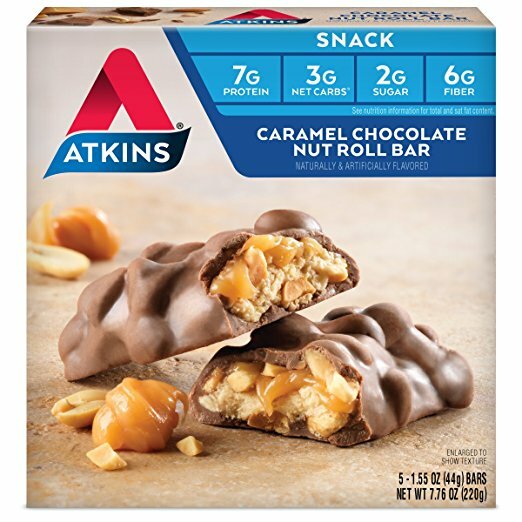 These Atkins bars are perfect for dessert. There’s chocolate, there’s caramel and there’s nuts. Works for me. I like that these are low in carbs and sugar but ALSO have 13 grams of fat. It’s important that you have that in your diet when you are on Keto. 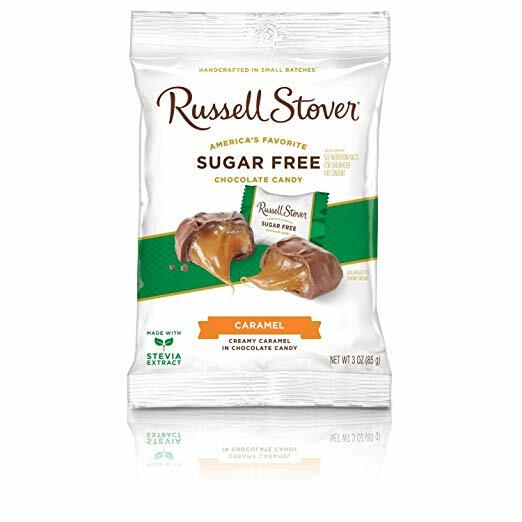 These sugar free candies from Russell Stovers are a go to sweet treat for my friend Laura from Little Yellow Wheel Barrow . There are a bunch of different varieties and they are delish. The do have sugar alcohols, so beware of that and, as with everything you eat, make sure these fit in your macros for the day, but these will knock out your sweet tooth for you. If macros and sugar alcohols are making your head spin because you’re just not that into Keto yet, you should check out Keto Bootstrap. It’s how I got started on Keto a year ago and it’s still a resource I use almost daily for Keto questions, recipes and community. 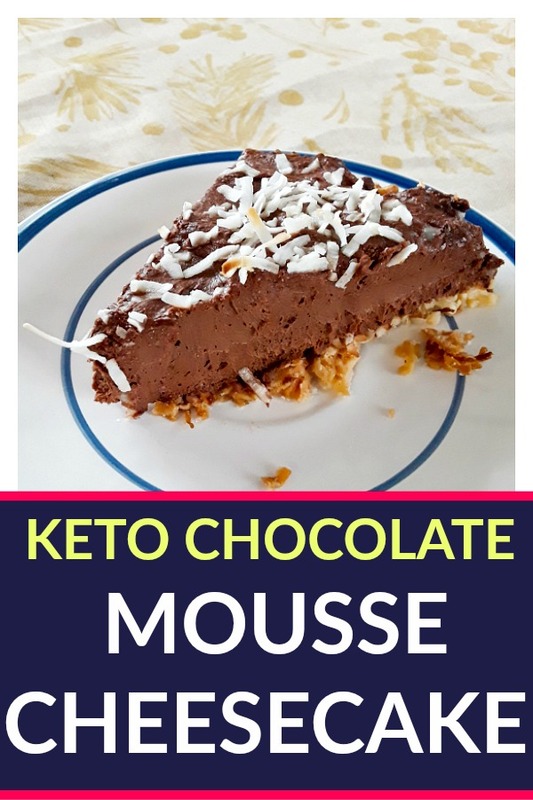 I debated whether to put this sweet and tart dessert in the Store Bought Keto Dessert category or the Quick Recipe Category. There’s really no recipe here, so I went with store bought. This is a favorite from my Keto friend Danielle at Have Butter Will Travel. 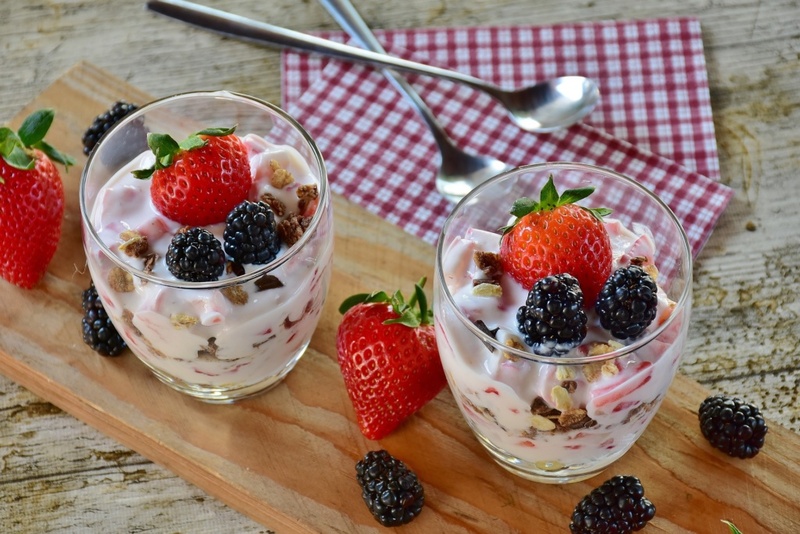 Pick your favorite low sugar berry and slather them in some cream. Whip the heavy cream if you’re feeling ambitious and have an extra 30 seconds (seriously cream becomes whipped cream very quickly). 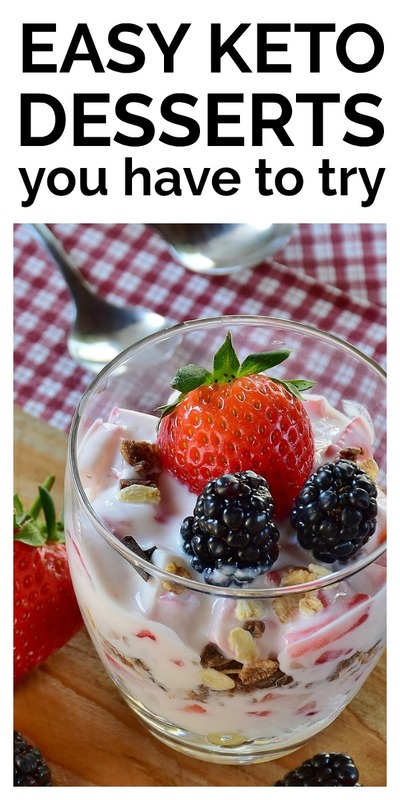 I actually never liked berries until I started Keto. I tried raspberries for the first time in ages last week and I LOVE them now. So weird. Ok, on to the quick Keto Dessert Recipes. Quick to me means, not a lot of ingredients and/or no baking. Fat bomb are perhaps my favorite thing to talk about when it comes to Keto. People never believe me when I say that I need to eat EXTRA fat some days. They look at me like I’m crazy. Or they might just be looking at me like “Oh my GOD will you please stop talking about KETO already”. Whip the heavy whipping cream into the cream cheese, vanilla and xylitol until fluffy. 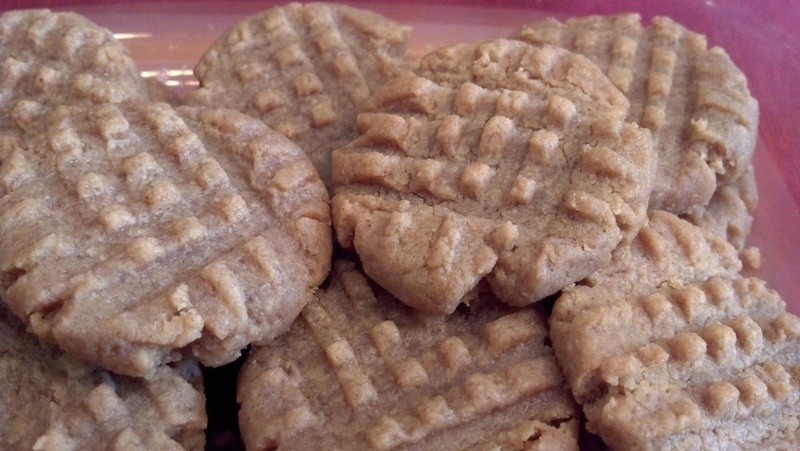 You can make fantastic peanut butter cookies that are quick and Keto. They are 3 ingredients. That’s it. I’ve made them for the blog, you can click the link above for the recipe, but if you have peanut butter, xylitol and an egg, you can make these cookies in minutes. (Ok, if you’re feeling fancy, you can add some of the optional ingredients, but bare bones peanut butter cookies, just three ingredients will do the trick). This is one of those things that I can make and my kids don’t even realize they are eating a Keto dessert. I have no picture of this for you. I have no recipe of this for you. All I have is this. This is delicious and easy and you should make it when you are craving something chocolatey and sweet. It’s Sugar Free Jello Chocolate Pudding and a cup of Heavy Cream, blended til smooth and delicious. This is the most work that you will do for a Keto dessert. To be honest, it almost doesn’t belong in this list of Easy Keto Desserts. However, it is PHENOMENAL and it is an entire pie, so you can make it on Sunday night and have a slice a night for a week. It doesn’t usually make it a week in this house. If you are thinking about trying Keto and you came here because you wanted to be sure you could still eat chocolate, I hope I have convinced you that you can. If you are looking to try Keto, I strongly recommend you try Keto Bootstrap. I’ve lost 25 lbs and I could not have done it without them. Keto can be complicated. Get the support you need. Now I want to hear from you! What’s your go to Easy Keto Dessert? Store bought Keto Dessert? Let me know in the Comments! If You Liked It Then You Should Have Put a Pin In It!